A lightweight distraction, but adding a competitive ladder or some more singleplayer content wouldve been welcome. Haven't you always wished chess had more rocket launchers? 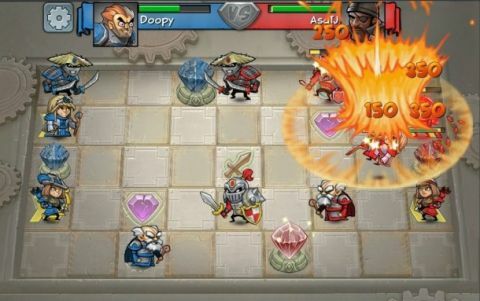 Hero Academy, a turn-based strategy game from Robot Entertainment, is probably about as close as you're going to get. It originated on iOS mobile devices, and the PC version includes cross-platform play against the mobile crowd who have had it for a while now. At the beginning of each one-on-one match, a selection of cartoon fantasy characters, spells, and items are placed onto a five-by-nine grid from a randomly dealt hand, out of a set pool for each of the game's five factions, as in a customisable card game like Magic: the Gathering. Each unit has a movement allowance, attack range, damage rating, and physical and magical defence. Some specialise in doing damage to other characters or fixed crystals (you can win the game by destroying all of either), others in healing, defence, or board control. Each faction has about five character types and five items, creating a fairly wide breadth of possible strategies. They all sport a unique look and playstyle, although only two of them (the human Council, and the PC-exclusive Team Fortress) are available to begin with. The other factions are unlocked with £1.27/$5 microtransactions. Each team gets an Action Point allowance. Every turn, you can perform five actions – summoning a character, using an item, moving a character, and attacking each count as one action. The game lets you play the turn out as many ways as you want before 'sending' it to your opponent, testing possible combos of movement and combat. This slows things down considerably: matches taking a day or more aren't uncommon, especially if you're playing against an iOS player spending their day breakdancing or videochatting with their parents (or whatever else it is Apple want us to think their consumers do). But that's not the real problem. The real problem is having five actions chucked at you with no chance to react, often creating a feeling of helplessness and frustration. Of course my über-knight is going to die if that puny archer gets to attack him five times in a row, and no perfect strategy or tactical analysis removes that frustration: especially when you might not get to respond for hours. The game also shows its mobile origins in that it has no singleplayer mode to speak of. Each faction can play a handful of challenges against the AI, but they shouldn't take you more than an hour to complete in their entirety. It also lacks a skirmish mode, which would have been great for experimenting with tactics. Despite its pacing issues and missing features, Hero Academy's depth and charming visuals could provide plenty of bite-sized strategy to accompany a boring work day. It's just better in your pocket than on your PC.